Shiraito Falls is located in Nagano. It is close from Karuizawa so many people visit here as their tour. It has about 3m high and 70m wide. 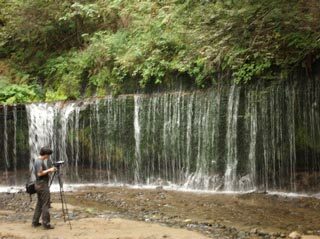 The water of Shiraito falls are come from the mountain, so the amount of water is not depended on rain. It was name Shiraito, literary means white string falls, because there are hundreds of small waterfalls which looks like white strings. There is free parking, food stands and restroom. This waterfalls has only 3m high but 70m wide. There are about 100 small waterfalls which surround the observation area. You can access very close to the falls.